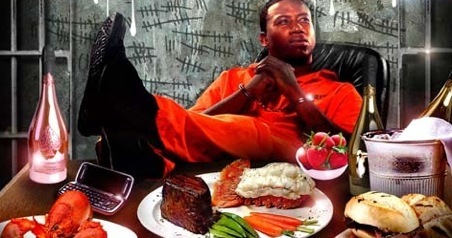 Atlanta rapper Gucci Mane was in the midst of a tremendously prolific hot streak late last year when he went to prison for a parole violation. He’s out now. As MTV reports, Gucci was released from Georgia’s Fulton County Jail early this morning after serving about six months of a one-year sentence. Gucci also announced plans to launch a new record label, 1017 Brick Squad, in conjunction with Asylum and Warner Bros. Gucci plans to release a new album, The Appeal, by summer’s end, and the label’s roster also includes the new group Brick Squad, which features Gucci alongside proteges OJ Da Juiceman and Waka Flocka Flame. Gucci also mentioned plans to tour. He’s booked on several big shows in the upcoming weeks, including the Best of the Best Memorial Day weekend gig in Miami and sets at Hot 97’s Summer Jam in New Jersey and Hot 107.9’s Birthday Bash in Atlanta. DJ Holiday, the man behind Gucci’s Writing’s on the Wall mixtape, was among the people greeting Gucci outside the prison, and MTV reports that the two plan to make a sequel to that mixtape. Given that Gucci actually manged to drop a mixtape from jail, it’s a fair bet that he’ll release a ton more music in the months ahead. « Stream a BRAND NEW song from Drake and Lil Wayne RIGHT HERE!